In The Church of Jesus Christ of Latter-day Saints (referred to by many in the world as the Mormon Church) one Sunday each month, usually the first Sunday, is designated as a day of fasting, and is thus referred to as fast Sunday. To fast is to voluntarily go without food and drink for a certain period of time. Proper observance of "fast Sunday" includes going without food and drink for two consecutive meals. It also includes attending "fast and testimony meeting." 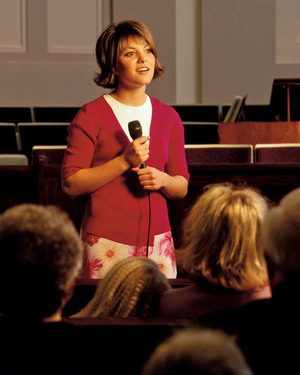 Fast and testimony meeting is a Sacrament meeting during which those members who feel prompted, share (or "bear") their testimony with the other members of the congregation. While individuals are directed by the feelings of their heart and by the influence of the Holy Spirit as to what to share, the formula for a "proper" testimony includes a personal witness of the divinity of Jesus Christ, the truthfulness of the Church, of Joseph Smith's role as a Prophet, and of the Book of Mormon as being Another Testament of Jesus Christ. Those testimonies which are given often include personal stories of overcoming trials or other faith-promoting experiences. In addition to observing the fast days set aside by Church leaders, a member can fast on any other day, according to his needs and the needs of others. Fasting combined with sincere prayer can strengthen a member spiritually, bring him closer to God, and help him prepare himself and others to receive the blessings of the Savior. Where there is power in prayer, there is even more power in fasting and prayer. Caution should be exercised; however, as to not fast too frequently or for excessive periods of time. Is not this the fast that I have chosen? to loose the bands of wickedness, to undo the heavy burdens, and to let the oppressed go free, and that ye break every yoke? Is it not to deal thy bread to the hungry, and that thou bring the poor that are cast out to thy house? when thou seest the naked, that thou cover him; and that thou hide not thyself from thine own flesh?" Then shall thy light break forth as the morning, and thine health shall spring forth speedily: and thy righteousness shall go before thee; the glory of the Lord shall be thy rereward. Then shalt thou call, and the Lord shall answer; thou shalt cry, and he shall say, Here I am. . . . If thou draw out thy soul to the hungry, and satisfy the afflicted soul; then shall thy light rise in obscurity, and thy darkness be as the noonday: and the Lord shall guide thee continually, and satisfy thy soul in drought, and make fat thy bones: and thou shalt be like a watered garden, and like a spring of water, whose waters fail not." Proper observance of fast Sunday also includes giving, in addition to regular tithing, a generous fast offering to help those members who are in need of temporal assistance. A fast offering should be at least the value of the two meals not eaten. When possible, a member should be generous and give much more than that amount. Mormon fast offerings are sometimes collected by members of the Aaronic Priesthood by going door to door in pairs and handing out fast-offering envelopes. Each envelope contains a "Tithing and Other Offerings" slip. A donor may record the amount of his or her fast offering and place the slip and money in the fast offering envelope while the two Aaronic Priesthood holders wait. These envelopes are handed to a member of the Bishopric or Branch Presidency, who includes them with other donations when recording donations on Sunday. Only fast offerings may be gathered in this manner. Financial clerks play an important role in processing fast offering donations and, under the direction of the Mormon Bishop or Branch President, preparing payments to those in need using fast offering funds. Will a man rob God? Yet ye have robbed me. But ye say, Wherein have we robbed thee? In tithes and offerings. Ye are cursed with a curse: for ye have robbed me, even this whole nation. Bring ye all the tithes into the storehouse, that there may be meat in mine house, and prove me now herewith, saith the Lord of hosts, if I will not open you the windows of heaven, and pour you out a blessing, that there shall not be room enough to receive it. And I will rebuke the devourer for your sakes, and he shall not destroy the fruits of your ground; neither shall your vine cast her fruit before the time in the field, saith the Lord of hosts. And all nations shall call you blessed: for ye shall be a delightsome land, saith the Lord of hosts. How are Mormon Fast Offerings Used by the LDS Church? Donations from fast offerings are not used for the same purposes as those monies given through tithes. 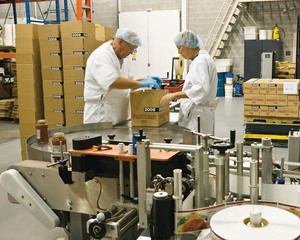 Mormon tithing funds are used for buildings such as meetinghouses, temples, and educational facilities, for the general maintenance of Church operations, and for costs of missionary and genealogical/family history work. Specifically, fast offerings are used to provide food, shelter, clothing, and other things for those who are in need, fulfilling the meaning conveyed in Isaiah 58:6-11, with attendant blessings to the giver and the receiver. And now behold, my beloved brethren, I say unto you, do not suppose that this is all; for after ye have done all these things, if ye turn away the needy, and the naked, and visit not the sick and afflicted, and impart of your substance, if ye have, to those who stand in need—I say unto you, if ye do not any of these things, behold, your prayer is vain, and availeth you nothing, and ye are as hypocrites who do deny the faith. Therefore, if ye do not remember to be charitable, ye are as dross, which the refiners do cast out, (it being of no worth) and is trodden under foot of men. And now, if God, who has created you, on whom you are dependent for your lives and for all that ye have and are, doth grant unto you whatsoever ye ask that is right, in faith, believing that ye shall receive, O then, how ye ought to impart of the substance that ye have one to another." When a member fasts, he feels hunger for a short time. It is during that short time that he literally puts himself in a position where he can feel of some of the same deprivation that those who are hungry and needy must feel. When he gives his generous fast offering, he is not only giving to bless the lives of his brothers and sisters in need, but in turn his life is blessed as well. The Bible teaches, in the New Testament, in Luke 6:38, "Give, and it shall be given unto you; good measure, pressed down, and shaken together, and running over, shall men give into your bosom. For with the same measure that ye mete withal it shall be measured to you again." How well I remember my father, the bishop of our Mormon ward, filling my small red wagon with food and clothing and then directing me—as a deacon in the Church—to pull the wagon behind me and visit the homes of the needy in our ward. Each member can also bring a wagon filled with hope to a family in need by paying a generous fast offering. If a member has the means to do so, but yet holds back from showing compassion to those in need, he is no better than those of whom the Prophet Moroni spoke of in the Book of Mormon when he said, "For behold, ye do love money, and your substance, and your fine apparel, and the adorning of your churches, more than ye love the poor and the needy, the sick and the afflicted" (Mormon 8:37). And if ye judge the man who putteth up his petition to you for your substance that he perish not, and condemn him, how much more just will be your condemnation for withholding your substance, which doth not belong to you but to God, to whom also your life belongeth; and yet ye put up no petition, nor repent of the thing which thou hast done. . . . I would that ye say in your hearts that: I give not because I have not, but if I had I would give. This page was last edited on 23 June 2012, at 11:49.